LaBeouf, whose last mainstream role was in 2011’s Transformers: Dark of the Moon definitely takes a departure from the Hasbro trilogy’s massive explosions, punching robots, and super models and trades them all in for the simple life: mountains, moonshine, and shootouts. It is a much welcome change. It’s the 1930s and Prohibition has come into effect, making alcohol illegal. But that only makes business better for the three Bondurant brothers, who moonshine business is a-boomin’. It’s all working out fine until outside authorities want in on the profits. The Bondurant brothers are less than compliant and the disagreement soon becomes an all out domestic war of hit-and-run tactics and using any dirty trick they can to see who will gain the upper hand. Based on the book, The Wettest Country in the World, which was also the film’s working title and written by Matt Bondurant, grandson of one of the main characters in the story. Lawless is violent. It doesn’t bother shying away from the violent details that even though sometimes excessive, it’s done in such a way that allows you to really feel what’s going on rather than just watch it. Fist fights and lacerations aren’t something to be proud of, but something to avoid whenever possible. Being that action movies are so abundant and Horror movies often glaze over wounds and gashes to the point of desensitizing us, while Lawless makes it to where we never forget. Throats are cut, noses are broken, and testicles are removed. None of it glorified and all feels necessary for the story rather than effect. The cast is one I could go on about. There doesn’t seem to be a weak link here and while I do favor certain actors here, I would be tough pressed to say that no one did their job to the best of their ability, which really is saying something. Guy Pearce shows up as the particularly nasty Deputy Charles Rakes; a man who is under the impression that the law must be obeyed under any circumstance. The problem is that Rakes believes he is the law and he’s going to do and take whatever he wants. This includes the Bondurant brother’s business and money. Their women too, if he feels like it. Aside from his character’s arrogant and violent personality, it’s all conveyed well through the look Pearce has adopted for the part. Hair space right down the center and plastered to his head, no eyebrows, and a permanent facial expression that tells you he’s better than you because you’re not him. He’s one you’ll love to hate. It’s good to see Pearce in a serious role such as this; the parts he played in last year’s Seeking Justice and Don’t be Afraid of the Dark seem like a quick paycheck with phoned in performance while Lawless’ role has him soaking up the repulsiveness a character like this needs. Pearce is no stranger to the director or writer of Lawless either. John Hillcoat, who also directed 2005’s ultra violent The Proposition is comfortable creating an environment where anything goes while Nick Cave (yes, that Nick Cave) is back in the writing chair and is also comfortable pitting hillbillies versus cops, neither preparing to give up what they believe to be theirs. This is a trio I wouldn’t mind working together again at any point in the future. LaBeouf, who recently stated his distaste for bigger-budgeted movies, the biggest reason being that he has no control creatively does a good job also and while his character isn’t as fun to watch as Hardy’s or Jason Clarke’s, he still carries enough of the story that without him, I’m not sure what actor in their twenties currently would’ve handled this role the way he has. Definitely not any member of the Twilight cast. While not being a big fan of his, I would still have to say it’s good for LaBeouf that while he isn’t the lead as far as I’m concerned (with Pearce and Hardy stealing most of the show), it’s interesting to see him in a more expansive role like this where he doesn’t play second fiddle to Indiana Jones, Will Smith, or Optimus Prime. Not everyone will enjoy this movie. It’s violent and it takes it’s time. Those of you who are interested from the trailers or even premise however, will enjoy this, and being that they don’t make many movies like this (at least not anymore), it stands out all the more. This entry was posted on 08/29/2012 at 9:05 pm and is filed under Reviews! 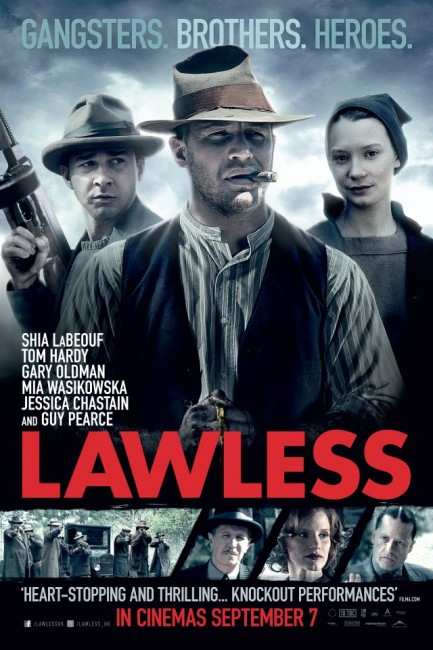 with tags action, drama, gary oldman, lawless, review, shia labeouf, tom hardy, western. You can follow any responses to this entry through the RSS 2.0 feed. You can leave a response, or trackback from your own site.